all the little stories» Blog Archive » co: the manos scarf. « the three categories of scrap. 52 inches of love and stitches. Can’t wait to give it to my loved one! Well, honestly, I kinda want to keep it and love it forever. Such pretty colors! But I think I really like hording yarn more than hording projects. Now, I guess I should be a good girl and finish the hoodie and the socks before I cast on a hat, right? 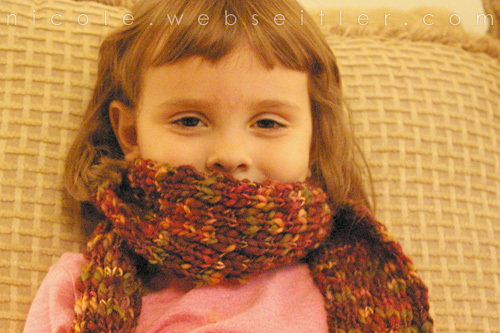 This entry was posted on Friday, October 26th, 2007 at 1:47 pm and is filed under family, knitting, photo post. You can follow any responses to this entry through the RSS 2.0 feed. You can leave a response, or trackback from your own site.